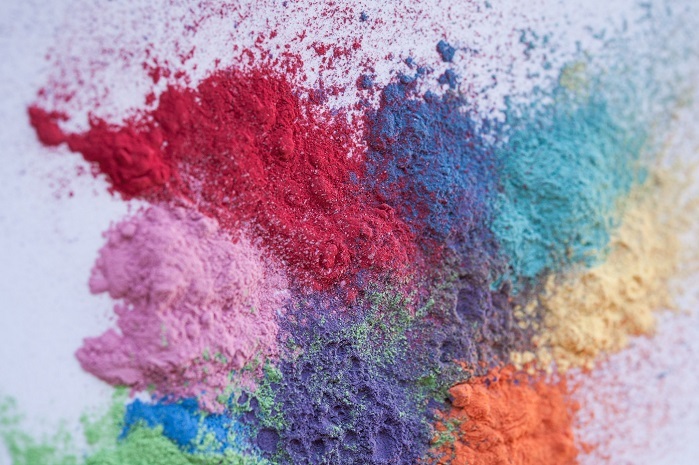 In 2016, the Italian textile chemical company Officina+39 invented Recycrom – colour powders made from 100% textile waste. In 2017, the clean dye won the Keyhouse Hightex Award at Munich Fabric Start 2017 and was applied to the first of two capsule collections by Italian high-street retailer OVS. As interest in this start-up technology increases exponentially, Recycrom is now set for truly mass volumes, the company reports. Recycrom is a full range of coloured powders made by recycling textile fibres from used clothing and manufacturing waste. Through a patented process, these fibres are upcycled into a uniform and solid powder that can be used as a pigment dye for fabrics and garments made of cotton, wool, nylon or any natural and most artificial fibres and blends. Recycrom can also be applied using various methods: exhaustion dyeing, printing and spray – with coating now under development. The colours come out with a washed-out and natural look – making it very on-trend, the company says. Brands can also collaborate with the inventors Officina+39 to make custom dyes from their own scraps and textile waste. “After winning the Keyhouse Hightex Award at Munich Fabric Start 2017, Recycrom had the attention of the industry,” the company says. Officina+39 began collaborating with Italian high-street retailer OVS, which has so far resulted in two capsule collections. Currently the company is talking to many other interested brands and retailers for a whole range of collaborations. The story behind Recycrom’s development is featured in the newly released Book of Denim, Volume 2. Officina+39’s CEO Andrea Venier will also be a featured speaker, along with other supply chain disrupters, during the denim industry innovations summit Kingpins Transformers in Amsterdam today.